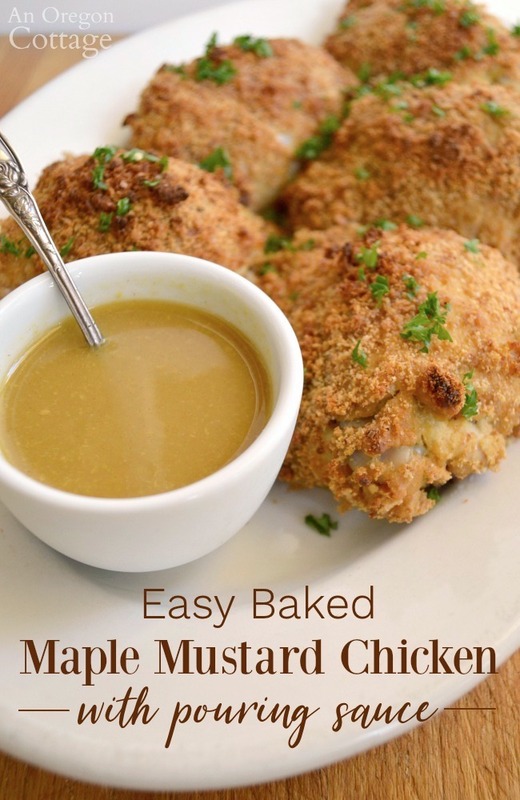 This recipe for maple mustard baked chicken is so delicious our kids ask for it for their birthday dinners! 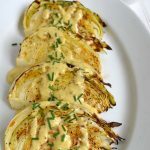 We all love it and I especially like that it’s easy to make and full of flavor from the dry mustard in the coating and the 2-ingredient pouring sauce. 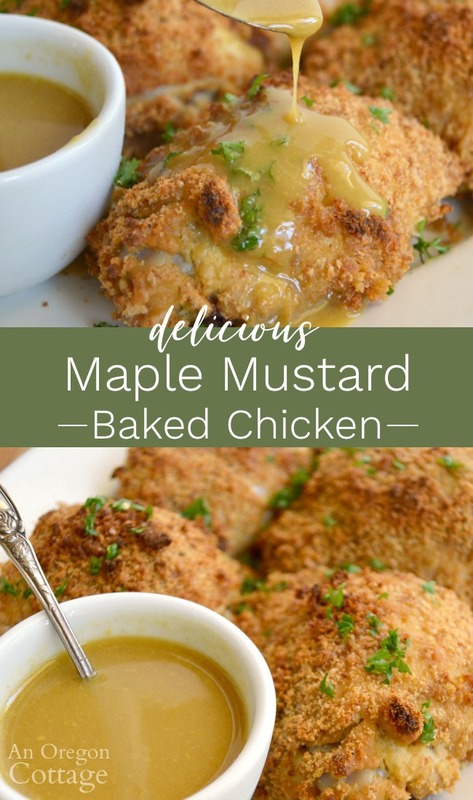 Maple mustard chicken is a one of my family’s favorite meals – so much so that it’s our most-requested birthday dinner meal, so you know this is a great recipe! 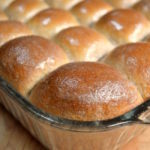 It’s also a good recipe for entertaining as well as regular weekday menus, since it’s basically mix-coat-bake and serve. 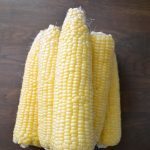 While the chicken is baking, you can make the rest of the meal (I’ve got some side dish ideas for you below), oh and whip up the two-ingredient pouring sauce that pretty much makes the dish. So, is baked chicken healthy? According to most nutritionists, chicken is healthiest when it’s either baked or stir fried. And this specific chicken with its crispy crumb coating will remind you of fried chicken without any of the added fat. 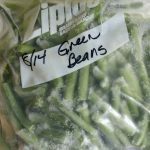 In addition, it uses only a few normal, real food pantry ingredients. 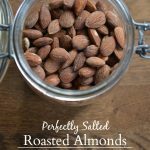 One of my favorite things are simple, healthy recipes made amazing with just a few great ingredients – and this recipe is definitely that! 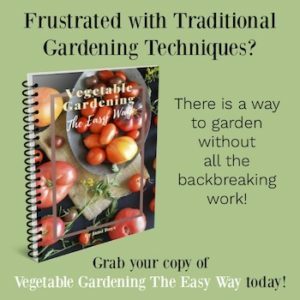 I found the original recipe years ago in a newspaper and I adapted it to our tastes, to be easier to make, and as a way to use our homemade breadcrumbs. 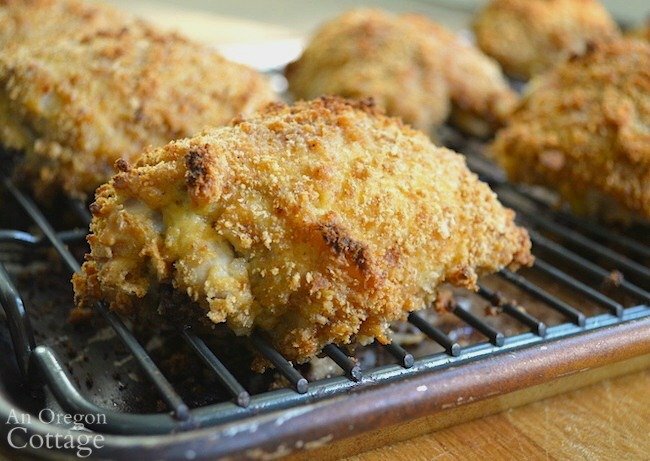 It’s a crispy-coated baked chicken, but the twist here is LOTS of mustard- both dry and Dijon. The mustard flavors are layered, which is probably what makes this chicken taste so amazing. You marinate the pieces in a mustardy brine for about an hour. 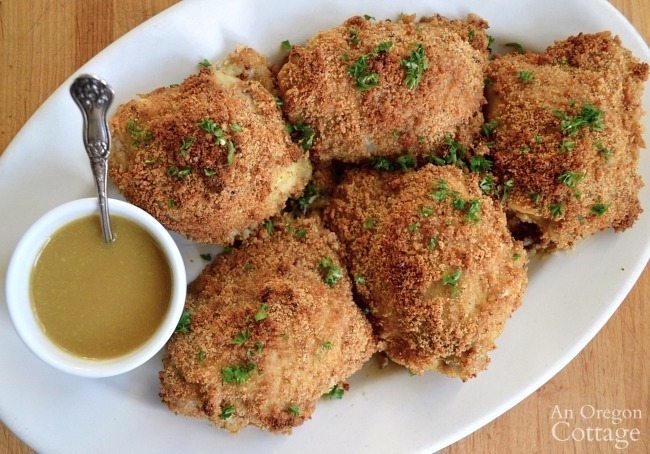 Toss bread crumbs with dry mustard and then roll the chicken pieces in the mixture. Serve the chicken with a mustard-maple pouring sauce. When you see the amounts of mustard called for in the recipe you may think it’s too much, but trust me – don’t be afraid to make it as written. Between the layers and the cooking, it all mellows into some of the best chicken you’ll ever eat – you won’t be disappointed. What kind of chicken pieces work best in this recipe? Our family prefers dark meat, so I mostly make this recipe with thighs and sometimes drumsticks. I think the extra fat in dark meat really helps the coating to crisp up and give a mouth feel like fried chicken. That said, I have made it with a whole chicken, cutting up the pieces into thighs, legs, and breasts (if you want to know how to cut a whole chicken, I have a tutorial here). I especially do this when serving to guests, since I know many people prefer breast meat. Breasts do work fine – they should just be pulled out of the oven about 10 minutes sooner than the dark meat to avoid drying out. 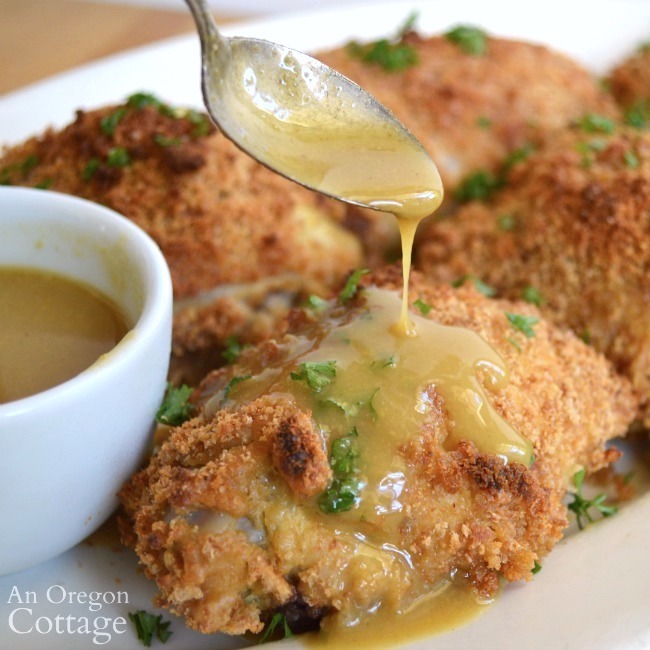 What puts this chicken over the top, though is the awesome maple mustard sauce you serve it with. And that’s all the sauce is – pure maple syrup and Dijon mustard. 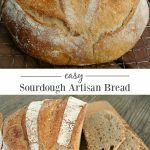 Sometimes the simplest ingredients create the best flavors! I don’t pour the sauce on the chicken before serving, but let each person add it to their chicken when putting it on their plate. That way the crust will stay crispy until just before the first bite and they can take just what they want. If you have any leftovers, go ahead and pour the remaining sauce over the chicken. The crust won’t stay crisp in the fridge and the sauce will penetrate all the coating making for a different, but still delicious, lunch the next day. We may or may not fight over the leftovers. 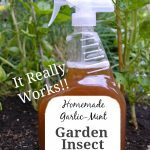 This is such a special recipe to our family, I’m pretty sure you are going to thank me for this! And if it’s a birthday dinner, serve this giant skillet birthday cookie for dessert! Click the arrow for the full maple mustard baked chicken recipe with print options!